Sea sponges are sedentary organisms that attach themselves to the sea bed and filter nutrients from the water that they force through their porous bodies with flagella. They are the most primitive of all multicellular animals, with just four different types of cells making up partially differentiated tissues in a simply organized body. Because of the lifestyle they lead, sea sponges do not need, and therefore lack, nerve cells, muscle cells and internal organs of any kind. However, researchers from the University of California at Santa Barbara now find that one species of sea sponge, called Amphimedon queenslandica, synthesizes many of the proteins that are essential for the cell-to-cell communication that takes place within nervous systems. These surprising findings, which are published in the open access journal PLoS One, therefore provide clues about how the first neurons may have evolved in the most ancient of animals. The reflectin protein comes from the Hawaiian Bobtail squid, Euprymna scolopes, which is native to the Central Pacific ocean. E. scolopes leads a nocturnal existence in the shallow waters off the coasts of Hawaii and Midway Island. Like other cephalopods, this species can manipulate the sunlight falling upon it to produce rapid changes in colouration and bioluminescence in order to camouflage from predators and prey and, as was recently discovered, to communicate with each other. These changes are produced by a number of neurally-controlled photonic structures found throughout the squid’s body. One of these, called the bilobed light organ, houses bioluminescent bacteria of the species Vibrio fischera. The squid and the bacteria have a symbiotic relationship – in return for generating light, the bacteria receive nutrients from the squid. The bacteria colonize the hatchling squid and secrete a toxin called tracheal cytotoxin. This toxin, which is a small fragment of a bacterial cell surface protein called peptidoglycan, causes whooping cough and gonorrhea in humans. But in E. scolopes, it serves a more useful function – it acts in synergy with various other substances to regulate the development of the light organ. The entire surface of the squid’s body can also be considered as a light organ, as it contains reflective tissues in the mantle. 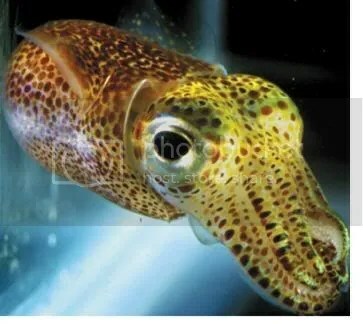 Unlike the bilobed organ, whose reflectivity is static, the organs in the skin mantle have variable reflectivity, changes in which can quickly camouflage the squid and even make it invisibile. The light organ and the reflective tissues in the skin mantle consist largely of proteins called reflectins. These are encoded by at least six genes which appear to be unique to squid. Nearly 44% of the reflectin primary sequence (the string of amino acids encoded in the reflectin gene) is made up of aromatic amino acid residues and amino acids containing sulphur. Reflectins are insoluble, and are deposited inside the light organs as flat, stacked structures called platelets. 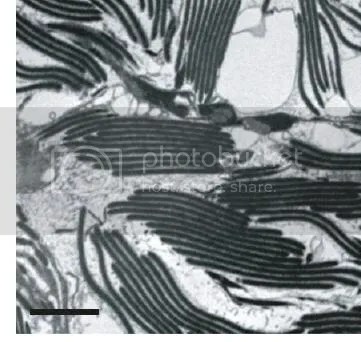 The reflectin molecules in the platelets are organized irregularly, and the layers formed by the stack of platelets alternate between areas of high and low refractive indices, so that the stacks act as multilayer reflectors (see the image below on the right). Because of this structure, incident light is reflected and scattered in all directions. The rapid changes in colouration that are characteristic of squid are the result of rearrangements in the organization of reflectin deposits within the reflective tissues, which may occur as a result of post-transcriptional modifications to the protein. Because of their chemical composition and the way in which they assemble themselves, the reflectins have the highest refractive index of any known proteins. In the new study, which is published in Nature Materials, Rajesh Naik and his colleagues at the Air Force Research Laboratory in Dayton, Ohio inserted the gene encoding reflectin 1a into Escherichia coli bacteria. The recombinant protein synthesized by the E. coli cells was isolated and purified, and the self-assembly of the molecules was investigated under different conditions. The photonic properties of the structures were then investigated, and transmission electron microscopy was used to examine the structures formed in detail. Naik’s group found that the reflectin molecules formed a number of different types of structure, depending on the conditions in which they were assembled. In solutions of very low concentration, the reflectin molecules spontaneously precipitated to form nanospheres with diameters of 50-1,000 nanometres (nm, billionths of a metre), while with higher concentrations they formed . At low concentrations in non-reducing conditions (that is, in the absence of spare electrons), the precipitated nanospheres were optically clear – light could pass unhindered through them. But in reducing conditions (with spare electrons available) precipitation led to the formation of filamentous structures. (These fibres different from the fibres associated with aggregation of abnormally folded proteins in neurodegenerative disorders such as Alzheimer’s Disease and the transmissible spongiform encephalopathies, which are formed by crystallization and not by precipitation.) And when left at 4°C for several weeks, these filaments formed a webbed structure that assembled itself into ribbons. The researchers then sought to process the recombinant reflectin protein into films and fibres. They used a technique called flow-coating: small amounts of protein solution were added onto a silicon wafer substrate, and the edge of a blade was used to spread the solution across the surface of the wafer. This cast a thin film of the protein across the surface of the wafer. By altering the concentration of the solution used, films of different thickness were formed. The thickness of the film was found to determine the wavelength of light reflected by it. For example, exposure to water vapour dramatically increased film thickness from ~120 nm to ~207 nm. As a result, the wavelength of light reflected by the film changed from 760 nm (which corresponds to red light) to around 400 nm, which gave rise to a blue reflectance. When the water vapour was removed, the film became thinner and then began to reflect red light once again. In this way, the researchers formed films that reflected every colour in the visible light region of the electromagnetic spectrum; They also made gradient films whose thickness differed, so that a rainbow of colours was reflected along the length of the film. The reflectin solution on the silicon wafer substrate was then dipped into an ionic solution (i.e. one containing positively or negatively charged atoms) called BMIM. This resulted in the formation of striped patterns of reflectin protein on the wafers. The patterns had highly regular spacing which extended unblemished for distances of up to several millimetres. The researchers found that the spacing between the stripes depended upon the velocity of dipping – the greater the velocity, the smaller the space between each stripe. These striped patterns are what materials scientists call diffraction gratings – reflective or transparent elements that split incident light into its constituent wavelengths and are used in a variety of optical devices. Light reflection by the reflectin stripes was observed even while the silicon wafers were still submerged in the solvent, and the wavelength of light scattered could be changed by increasing or decreasing spacing between the stripes. The researchers had provoked nature into initiating some of her own mechanisms of nanofabrication. The reflectin molecules assembled themselves into nanometre-sized spheres and striped microstructures with photonic properties that could be manipulated. Knowledge of how the self-assembly of reflectins can be manipulated will inform researchers who are trying to synthesize supramolecular nanostructures from the “bottom up”. But a better understanding of these mechanisms and of the properties of reflectin has another potential application: the synthesis of small-scale materials for use in the development of invisibility cloaks. To this aim, various research groups are using so-called metamaterials, whose nanoscale properties alter the way in which their surfaces reflect visible light. Objects are visible because light bounces off them; in theory, a material which could cause incident light to pass round it could be used in a cloak that covers objects and renders them invisible. The military is, of course, very interested in developing such a material. As the current research was partly funded by DARPA (the research and development arm of the Pentagon), the development of an invisibility cloak could well be the ultimate aim of the project.